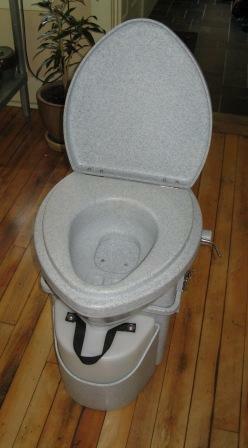 I recently tracked down a brand new, never installed, Nature’s Head desiccating toilet with solar fan on Craigslist. The previous owner purchased it to install on his boat but then realized it was too big so had to give it up. We were only too happy to take it off his hands! Better known as a ‘composting’ toilet (but in full-time practice, more of a several-month holding tank) this rugged throne is designed to separate liquid from solid waste, thus eliminating the issue that many people encounter with standard all-in-one composting toilets; namely, the stinky slurry created when “Number 1” and “Number 2” are combined. My lengthy research on the topic of manufactured composting privies (yup, there’s lots to know) turned up a surprising number of disgruntled owners (for every ‘all-in-one’ brand out there) who complained at length on the subject of odor and fetid slop [sorry for the imagery]. However, in stark comparison, I was unable to turn up a single owner of a urine separating toilet that had anything negative to say in this regard. Hmmm. Seems the nitrogen in pee is the problem, but, if kept clear of its close cousin, it can also be part of the solution! Since flora loves nitrogen, users of urine separating toilets can take huge advantage of the limitless supply. It seems that diluting the urine captured by this john with a few parts water and using it to hydrate your garden produces floral dividends, thereby exempting the gardener’s participation in the petroleum-based fertilizer industry! Who knew?!? In the matter of the solids, they dry-up and drastically shrink in volume thanks to an occasional dose of peat moss, or ground coconut shells, or really any brown-matter (dead leaves, etc. ), a built-in rotating agitator wand, and by the action of a constant stream of filtered air, the product of a solar (or stock 12 volt) fan that is powered by day via the sun, and all through the night by solar energy stored in its onboard NIMH batteries. A fan running constantly is all it takes to dry it out, plus not mixing in any liquid nips the olfactory issue in the bud. They say dried up poo has no negative odor and, by way of confirmation, owners of these innovative heads affirm this fact resoundingly. Our installation will also uniquely feature the ability to switch between indoor air and outdoor air, so that we can isolate the toilet’s ventilation system from that of the home’s if we choose to run the wall-mounted exhaust fan we plan on installing in the wall above and behind the Origo alcohol range in the kitchen area. In other words, since running the kitchen exhaust fan could overpower the toilet’s exhaust system – thereby causing the airflow to run in reverse – this scenario is something we’d like to avoid. Somewhat related to this topic, we also have to pay particular attention to the effects of negative or low indoor air pressure, relative to the pressure outside, for another reason: the flue that will transport the smoke from fires we build in our Little Cod wood stove requires negative/low pressure outdoors in order to draft properly. So, to address this issue, and to balance the introduction of fresh air into our tightly constructed home, we’re exploring the addition of a small, manually-controlled, diaphragm vent placed near the stove’s location; something like an American Aldes Airlet TL98 or Fresh 100. Of course, our design will also incorporate redundant CO detectors to monitor the level of carbon monoxide and alert us if there’s a problem. As Americans, we waste most of our water in our bathrooms. Toilets alone account for 27 percentof household water usage. This can move closer to 40% if you have a leaking toilet. On the other hand, composting toilets reduce use of finite fresh water resources, lower sewer/water costs, provide natural fertilization for gardens, reduce marine pollution by reducing large effluent releases into waterways, eliminates the need/cost for extensive sewer systems and chemical treatment solutions, and, if used with solar powered fans, requires no electricity. How is the resulting solid waste handled? Does the unit empty from the bottom. .side. ..front. ..rear? Where do you put the solid waste? Does it need addiional handling? Thanks for your questions! Check out the manufacturer’s website (http://www.natureshead.net/) for photos showing how to empty the unit. Our plan is to place the dehydrated waste into re-purposed 55 gallon plastic drums for additional composting. Given our climate this will require at least a full year of additional curing before it will be safe to apply as a soil amendment. Check out the WHO’s guidance on managing excreta use in agriculture [http://whqlibdoc.who.int/publications/2006/9241546859_eng.pdf]. Another good document is the following put out by EcoSanRes: http://www.ecosanres.org/pdf_files/Urine_Diversion_2006-1.pdf.